There’s something about a crisp, green Calgary lawn that is just so satisfying. After all, nothing is worse than seeing your neighbourhood sprinkled with pale brown, unhealthy lawns littered with dry patches. Quality residential landscaping in Calgary can be challenging to maintain. With that said, there are ways to help you keep up that lusciously healthy lawn and avoid costly mistakes. Lawn care in Calgary is so diverse. Have you ever wondered how two homes, side by side, can have such contrasting grass colour? They get the same sun, same water- so what’s the difference? We always make sure our clients understand the importance of a well-cared-for, healthy lawn. First, it makes a huge difference in the long run, especially when it comes to resale value. It’s curb appeal – the first thing someone will notice as they approach your home for the first time. I’m sure we don’t have to tell you of the power of first impressions! Second, through proper Calgary lawn care, everything in your yard will start to have a healthier look over time. It even improves the overall air quality of the landscape surrounding your home. Take a look at some of our Calgary lawn care tips that will ensure a top quality lawn for your property. Mowing your lawn can be a nuisance, but if you create a weekly mowing schedule for yourself, it’s a great routine to get into. We recommend that our clients mow to a height of approximately 2” to 3”. By doing so, you maintain a manicured, natural look to your Calgary lawn. Make sure you sharpen your blades every spring, especially before your first cut. Unsharpened blades won’t give your grass a proper cut. You’ll find yourself having to go over the same spots several times to get all the missed patches. Otherwise, your lawn can look uneven and poorly maintained. Don’t be afraid to get creative in regards to your mowing pattern. Every time you mow, start from a different direction than the previous cut. This way, you are cutting more leaf surface on weeds that may tend to lean in different directions. Another bonus to doing this is a reduction in soil compaction and turf wear-and-tear from the mower wheels. They’re inexpensive, efficient and help you catch the spots the mower couldn’t reach. There are many areas – such as against retaining walls, garden beds and walkways to name a few – that the lawn mower can’t get to. 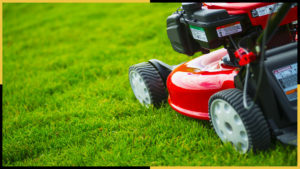 Trying to force the mower onto those areas can ruin its blades and even damage or scratch the surfaces you’re trying to cut against. A trimmer is all you need to do the trick! If you’ve just had a Calgary landscaper do your sod installation, you’ll need to be watering it twice per day. Do this for the first two to three weeks minimum depending on how hot the weather gets. Water once early in the morning, preferably around sunrise. Water again later in the evening or at sunset time. This schedule is ideal for allowing the water to soak into the soil. Heat and humidity will be lower at these times than at other points of the day. This prevents the water from evaporating right away and ensures complete absorption. Once the roots are established, you should infrequently water it, depending on the weather and the health of your lawn. Generally, once your grass has been established, you want to apply about one inch of water to soak into the grass daily. A great habit to get into is watering your lawn early in the morning before going to work. Think of it like feeding the dog before starting your day. You want to make sure the grass is well fed for the day, so if it gets hot, it doesn’t burn patches. Give it another go once again after supper time as the sun starts to make its way down. Fertilizing your lawn is always worth considering for optimal lawn care in Calgary. When nutrient levels drop below what’s needed to maintain healthy conditions, fertilizing will give your lawn a good boost. There are several organic fertilizers on the market that can supply all the nutrients you need for a healthy lawn. Just walk into your local Calgary garden centre and ask an expert! There are three major nutrients you should be looking out for: nitrogen, phosphorous and potassium. Read the product’s label to make sure that it has these three elements. Providing your lawn with all three nutrients will ensure you have proper leaf growth, root growth, and future stress resistance. The fertilizing process is simple: just read the directions on the bag and apply it accordingly. Many times, when you see patches of grass that seem like they’re dead, or just worse off than the rest of the lawn, you should give it some time. Add a little extra water to the problem area and see what’s happening. If it’s not repairing itself, try adding some grass seeds to it and keep an eye on it. Of course, if none of the above works, you can always cut out that piece and replace it with a couple of rolls of sod from any Calgary landscape supply store or garden centre. When it comes to lawn care, shaded areas are often a challenge for many home-owners in Calgary. Residential landscapers should keep an extra lookout for areas that sit up against your house or under large canopy trees as they face an added challenge when trying to grow appropriately. For our sod installation services, we never recommend lawn installations on the 4’-8’ side yards between homes because they almost never make it due to lack of sun. This applies to some of the new neighbourhoods being built – mainly in the Northwest and South East of Calgary – in particular. Your lawn needs a minimum of 4-6 hours of direct sunlight so it can prosper. Having grass in the areas against your house or fence is also a bad idea because the heat that comes off those materials tend to burn the grass underneath them. The best solution is to have decorative rock or mulch along the side yards and garden beds against your fence or house – this will also be lower maintenance over time. Let the grass be in the middle, and your planting beds are your borders. If you follow these critical Calgary lawn care tips, you’ll be on your way to a healthier, long-lasting lawn. As trusted landscapers in Calgary, Tazscapes can help you save big bucks on the perfect lawn!